Happy Halloween you crazy kids! No, I am not cliche girl for Halloween, but seems like I should be, huh? I am writing in to let you all know that I finished knitting and weaving-in my Fall Knit Along Nutkins. 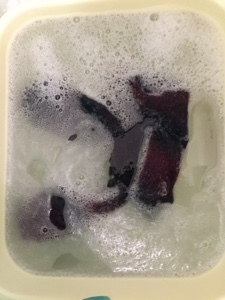 I woke up and soaked them at 6 am this morning. They are currently blocking because hello, it's 10/31! Something happened this weekend. I feel determined to go into the dark days of winter with a productive mentality. I'm keeping up with the activity -- not as much as last week but I'm getting my cardio in. Also, thanks to the good influence of Bridget I have been slowly nipping away at corners of clutter. The Kid and I went through 2 of his drawers/bins of clothes when I cornered him, We only culled a little bit, but that bit was something to make some space. We went through a shelf in the hutch that had old art projects and old broken crayons and markers etc. We still have a lot, but there is space again. I just need to think, this is okay, I'm going in the right direction. Wishing you some breathing (and surface) space. A good portion of every week is running through potential baking recipes. 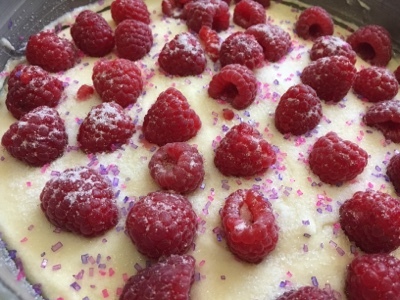 I bake for both my son's soccer team as well as my recreational slow-pitch softball team that my friend the Canadian Kim got me a guesting spot on when they were short players. I've become pretty regular and honestly, It's really fun to be part of a team sport again. I'm just catcher and basically get my peripheral vision tested behind the mask as I squint and sweat in the bright sun. (I promise I wear sunscreen). I like it. I wish I was hitting better, but I think in time that will come back, especially if I can get myself to the batting cages. Crap, I might even let Dad take me so he can bark / coach at me and we can relive our youth together. LOL. Well, if we do, we have to bring Sister to complete the nostalgia. Anyways back to cake. 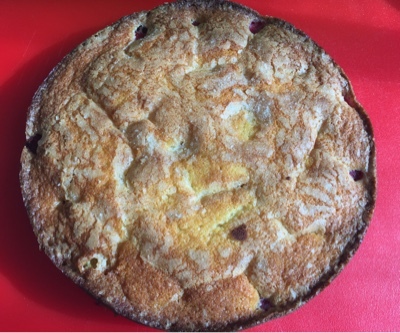 I've been enjoying making this buttermilk raspberry cake, I made it twice last weekend. However I have strawberries that I am trying to use right now, so that's what's being baked later this week. It's simple to make and it delivers. Excellent for breakfast, coffee, tea or dinner parties with a bit of fresh whipped cream. 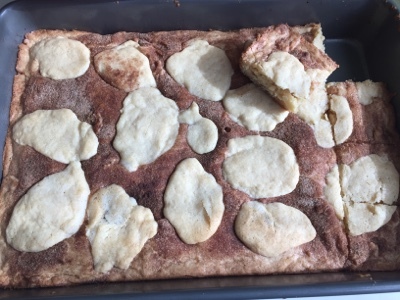 I did Snickerdoodle Bars for the kid's team last match and I think I'll rotate these into this weekend's game for my team. 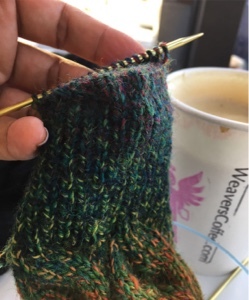 Thank you everyone for your lovely encouragement as I worked on my second sock for the Fall Knit Along. I have the knack of the old Nutkin now. I admit the first sock was a little tighter than I was expecting. Maybe a US 2 instead of a 1.5 next time for needles. Surprising for a 64 cast on. Anyhow, that photo from yesterday was a moment sponsored by overpriced hipster coffee and 45 minutes of such enjoyable knitting post Pilates. 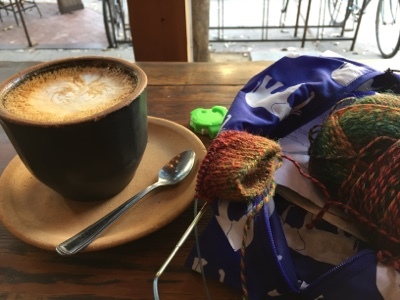 I don't get to go to cafes and knit by myself much anymore and it was such a treat. You know what else is a treat? Reformer Pilates, Holy hotpants it's not a cheap activity, but I do like it. I started it because my back and my foot can only take so much higher impact activity. I now would prefer to run only if I'm being chased, but I won't abandon running completely... maybe. I am using Reformer along with some dance classes to continue to supplement my cardio at the gym because it makes me happy and keeps my physically active which also is good for my brain. Also all that core and upper body strength the Dr. is always suggesting doesn't seem as daunting when I'm distracted by springs and loops and thing opposed to just my body on a mat. ha! Have you tried Reformer Pilates? Do you have an activity you can do through the colder months that make you feel a little healthier or stronger? Walking is fabulous, but I always seem to tack a treat onto the end of my walk ;) Whatever it is, if you can, stick with it. Health and Happiness for us all. Knitting the fall along. I think I can. I think I can. A little something: I've been having some lovely weekends. They've been filled with friends and family and it's just been full and good. The Fall KAL status: Aside from clutching the laughter and burying myself in Mom aka checklist lady mode I managed to carve out a few hours to knit and make some rounds on Nutkin. I decided on a longer leg for this sock. My cuff is at 10 rounds and the pattern itself is 80. Things were going smooth, but I had some problems at night knitting with this yarn that is dark and shifts colors. I had a hard time seeing my stitches both in knitting and backing out. Escapism: I was really tired and my back was aching a bit and just needed to lay there a bit, sometimes knitting, sometimes knot. I revisited the Bletchley Circle series on Netflix. Good stuff. Trying to read something, anything again: I also finished a book. I KNOW! A real book, not magazines, online articles and tweets! "Do Not Become Alarmed" It's a vacation read. Something that I imagined page turning with hours to spare lining up the next book. I started off intrigued, wondering where it would go. Then it sort of stalled on me. Last night I couldn't sleep, yet I couldn't knit anymore. I picked up my phone and turned on the kindle app and started reading. I notice when I read a paper book, there is an overall calming effect.I think it's why many of us can read ourselves to a contented sleep. Even if it's something scary or absolutely riveting where I know the potential for me to pull an all nighter is inevitable ... I can give into it. Are you familiar with Harry Potter movies? There is a scene in The Chamber of Secrets where Harry Potter literally falls into a diary. Yeah, that's how I feel. Even exhausted but determined to keep reading, if it's paper, I get into the zone, I cross over. It appears with digital reading this is not a guarantee for me. I've had positive experiences. But in the case of this book, something wholly uncomfortable happened to me. I got to the point where I was more than halfway through it. I felt like the plot was getting ... redundant. I didn't like the characters. I didn't like most of the children. I didn't like their parents. The people I had some sympathy for were feeling flat, everyone felt flat, except for that bright light I was reading against. I wasn't tired, but I was irritated. I was determined to finish this book. I wasn't expecting some great literary read from this story. It was supposed to be escapism, but I couldn't be sold. I read so irritated with the book, and so unsatisfied with the ending that I'm not sure if I can tell you my opinion is valid. I'm not deterred from reading on my phone either, though I prefer my kindle if I'm going digital. The truth is, I just liked thinking about fake people and fake stories and making the words mean something in my mind. I could use more of that. I think I'm not sure what kind of stories I like anymore.